Reboots are nothing new, but the recent trend of packaging them as sequels has yielded a crop of movies recently that’s reinvigorated their dormant franchises. First Creed remake Rocky, then The Force Awakens retold Star Wars. 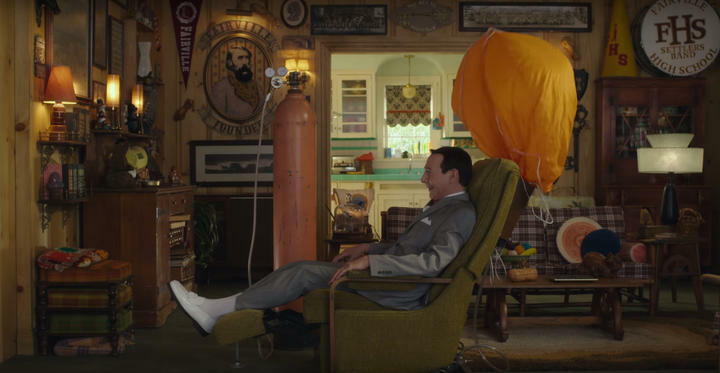 Now, the ageless man-child Pee-Wee Herman, star of two movies and a TV show back in the ‘80s, has returned with the familiar Pee-Wee’s Big Holiday. In broad strokes, it’s a remake of 1985’s Pee-Wee’s Big Adventure. As well, it functions as the first canon return of a beloved character that’s been gone for 25 years and a vehicle to introduce the character to a brand new audience. As a remake, it’s not without its flaws. As a reintroduction to the ageless goof responsible for almost every grade-school comeback of the ‘80s and ‘90s, it’s a charming success. Pee-Wee Herman (Paul Reubens), that charming mind of a child stuck in the body of a man, has been spending his time lately working at a diner in quaint Fairville and that’s just fine with him. That is, until Joe Manganiello (playing himself) walks in and bonds with Pee-Wee over chocolate milkshakes and chewy candies. Drawn to Pee-Wee’s refreshing lack of awareness of his fame, Joe and Pee-Wee instantly become best friends. Before heading off on his way back to New York City, he has Pee-Wee give him a tour of Fairville. When he discovers Pee-Wee’s never left town before — aside from that whole chasing-after-his-bicycle thing in his first movie, apparently — Joe invites him to his birthday party, in five days’ time. With that, Pee-Wee hits the road, encountering such personalities as a farmer desperate to marry off one of his nine daughters, a reclusive cave-dweller with daddy issues, a trio of bank robbers straight out of a Russ Meyer movie, and many more. If there’s one large fault with the movie it’s how episodic and uneven the main bulk of it is. The order of pretty much every scene in its middle 45 minutes could be rearranged with absolutely no impact on the plot or the movie itself. Moreover, while Pee-Wee’s Big Adventure had a similar aimlessness, that movie remained consistently entertaining enough to keep you from caring. Sections of Pee-Wee’s Holiday that don’t work end up just providing time to start noticing little problems that you wouldn’t if you the film remained steadily hilarious. When the movie does succeed, though, it’s as good as anything the character’s been in. The wordplay that dances between clever and childish, the sunny sense of naive wonder, the random moments of horrifying darkness that come out of nowhere: it’s all here in spades. Reubens, 63, is as comfortable in the role now as he was in his thirties. Visually, if you didn’t know 20-plus years had passed, you’d never think it, watching the energy and alacrity with which Reubens attacks his performance. You can tell he’s missed playing the loveable scamp and relishes getting to don the slender suit and red bow tie again. The direction of Justin Lee is good, but not as interesting as Tim Burton’s was. His direction is an imitation of Burton’s work in Pee-Wee’s Big Adventure, but it’s a decent enough imitation. It’s I-Can’t-Believe-It’s-Not-Burton, but hey, there’s nothing wrong with watching Go when Pulp Fiction isn’t an option. 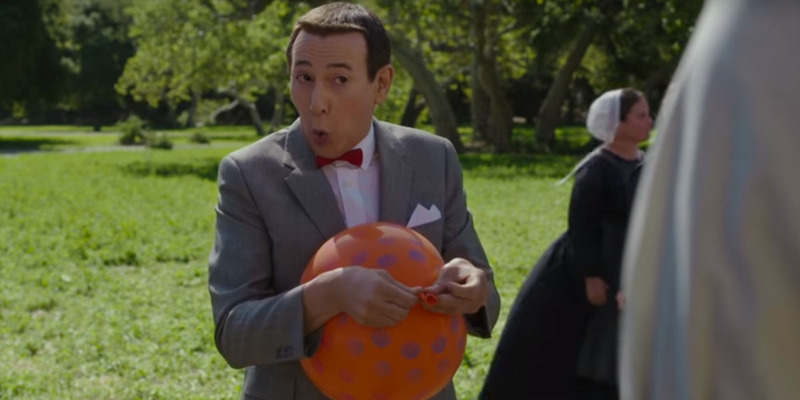 Pee-Wee’s Big Holiday is the fourth film produced by Netflix and there couldn’t be a better home for him. Script issues aside, his third movie walks a perfect balance of freshness and nostalgia. Seeing Reubens back in the role and so gleefully excited to be revisiting this world is a refreshing relief, and far more akin in quality to Netflix’s resurrection of Arrested Development than their recent revival of Full House.